we're all set and ready for the 9th staging of CHOICES Career & Education Expo on Tuesday June 2 from 9a.m. – 5p.m. at the Alfred Sangster Auditorium at the University of Technology, 237 Old Hope Road, Kingston 6, Jamaica. Approximately 2,000 young adults are expected at attend the event at which up to 50 exhibitors including educational institutions and public and private sector organisations will display and promote options, opportunities, goods and services. These include UTECH, UWI, NCU, IUC, UCC, the community colleges, The Caribbean Maritime Institute, B & B University College, Vector Technology Institute and many others. On the day’s agenda will be discussions on subjects such as budgeting basics for students; dealing with sexuality; managing conflict; hot jobs in tough times, career talks; feature presentations on stage, plus a fun-filled programme of short presentations, quizzes, special guests, prizes and surprise give-aways. Especially for guidance counsellors, teachers, principals and parents will be a presentation on “The Impact of Criminal Violence on Education”. 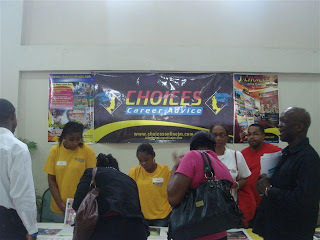 A wide vista of career opportunities for the undecided youth will be opened up. For the teens there will be career talks on academic institutions and their programme offerings and the academic subjects to pursue in order to achieve desired career goals. One-on-one career counselling will also be available for those who need help and advice on the way forward for them.